The visitors played their captain and nominal full-forward, Redmond Barry as an extra sweeper in front of their full back line for the entire first half and it was not very conducive to attractive football. At times there were only four or five players in a full half of the Salthill pitch and watching sideways and backwards passing movements with both teams trying to penetrate the infamous "blanket defence" is not what anyone really wants to watch. Former Kerry manager Jack O'Connor recently described the game between Cork and Donegal as being "hilarious". But he was not laughing, such was the defensive strategies being employed by both sides. Anyway, that aside, last weekend was about getting a result for the home side and grabbing the two points that would mean they were safe in Division Two for next year. It was a strange game in many ways and could have gone either way until a scoring burst of 1-1 from Gary Sice and Michael Meehan gave Alan Mulholland's team the impetus to push on and win decisively on a score-line of 1-16 to 0-11. Substitute Michael Martin, added three more scores - two from play - and Wexford fell away very badly in the last ten minutes. 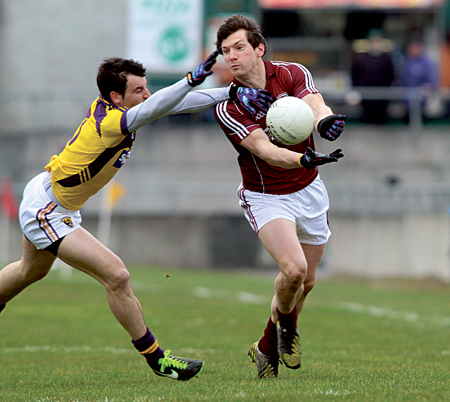 Galway had good performances from Colin Forde, Gary Sice, Fiontáin Ó Curraoin who was playing his second important game in twenty-four hours, and Paul Conroy. Danny Cummins was busy in the full forward line and snaffled 0-3 from play over the hour. Seán Armstrong had a good game too and showed both hunger and work-rate, as well as hitting five important points, including some high quality frees in the first half. Team captain Finian Hanley led by example at full-back and had his best game of the league campaign. Alan Mulholland was pleased with the way the side pushed on in the final quarter. “We are relieved. If we hadn’t come through last Sunday we were looking at the other end of the division so that put relegation to bed now." “The first-half performance wasn’t what we wanted at all. We were trying to come to terms with them. I think we were a bit nervous, making a lot of errors that the neutral would say were very unforced. “We asked for a big performance in the second half and we settled down with a little bit more confidence in our play. Once we began to play some good football we were able to pull away. “The win will help our points difference, which it might come down to if we finish off with a win in Armagh. Last Sunday was about getting rid of the relegation worries. Hopefully we will put in a similar performance against Armagh”. Scorers for Galway: S Armstrong 0-5 (4fs ), G Sice 1-0, M Martin (2fs ), D Cummins 0-3 each, M Meehan 0-2 (1f ), P Conroy, C Doherty, G Bradshaw 0-1 each. Galway: M Breathnach; J Duane, F Hanley (Cpt ), C Forde; G O’Donnell, K Kelly, G Sice; F Ó Curraoin, A Griffin; J O’Brien, S Armstrong, C Doherty; P Conroy, M Meehan, D Cummins. Subs used: G Bradshaw for Duane (34 ), E Concannon for Griffin (h-t ), S Denvir for O’Brien (54 ), M Martin for Doherty (61 ), S Walsh for Meehan (64 ).